Flush away harmful chemicals and irritants without damaging eyes with Eyewash solutions. Your workers work hard to make your facilities run, so they deserve the best in care when the worst happens. This means you need to keep your eyewash stations in good condition and be equipped with eyewash solutions, so they can provide optimal care in case of emergency. Eyewash solutions will maximize the effectiveness of your eye wash kit, which is a critical consideration in the event of a spill, gas leak, or other emergency that risks giving workers severe injuries such as chemical burns or poisoning. 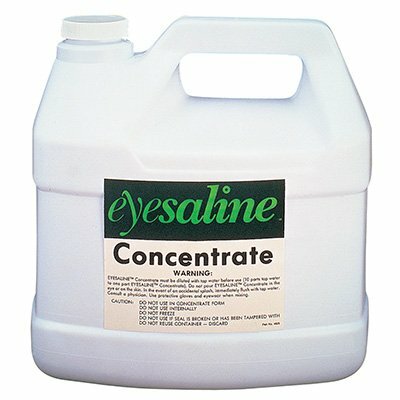 When that happens, saline eye wash solutions and special eye washes are necessary to neutralize hazardous chemicals before they take effect on the skin or organs of an exposed worker. Get the first aid eye wash solutions and eye wash kit you need from Seton, the industry leader in safety products, and make sure you can wash away any potential tears that could result from an accident!